That can be the road to getting things done, but it can also begin to feel like I’m never satisfied or content! Can I really stay content and satisfied (but not complacent!) if I’m constantly putting myself first? This is something I really, personally struggle with. I will admit, there are (many) days when I start my day with me instead of Him, with my own ambitions instead of His word. It wouldn’t be a bad idea to make those first 30 minutes of “everyday” for Him and make it a daily habit instead whatever else I’m putting first! Maybe that’s what my resolution should be for the year (and every year!) – less of me and more of Him? Everything else leads to discontentment and more of my own ambitions. In this world, it’s easy to believe that we can only become better and more perfect if we do this, give into that, or buy x, y, and z. But, really, that’s the lie. Wealth, beauty, and power are achievable, but at what cost…and to what end? With weakness in mind, I know that food can be a weakness for many. I personally can never say no to a cookie! Or three. And trust me, I had my fair share of cookies this past month. I also don’t regret it. The Christmas season comes once a year and that is why I lost count while I was over at my in-loves on how many of their delicious sugar cookies I ate. They were good and I was not about to deny myself. 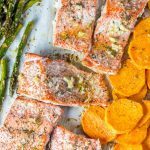 But now that we’re in a new month and the sugar cookies are gone, I’m aiming to put a few more healthier dinners on my menu, one of which is this one pan salmon dinner. 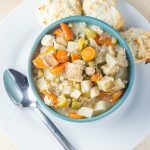 I know we’re all recouping from a busy holiday season, and after cooking and eating your way through the month of December being in the kitchen is probably the last thing you want to do. Which is why this meal is perfect! 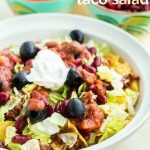 You’ve got your main course and two sides that all cook alongside each other, limiting your time in the kitchen (and the amount of dishes you use!). I like the idea of salmon because it’s SO good for you. 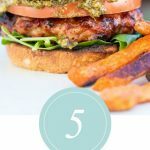 I’m addicted to sweet potatoes, and for me, they are a must on every sheet pan dinner I make, but russet, red, or white potatoes would work as well. The veggie I mix up, though. I love asparagus, but when it’s not on sale it is spendy. 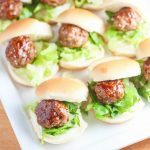 You could substitute fresh broccoli or cauliflower florets, green beans, Brussels sprouts, carrots…whatever is on sale at your store that day, and the cooking time won’t change at all. And if you’ve never roasted your vegetables before for a simple side dish, well, you are in for a treat because it doesn’t get any better than that! 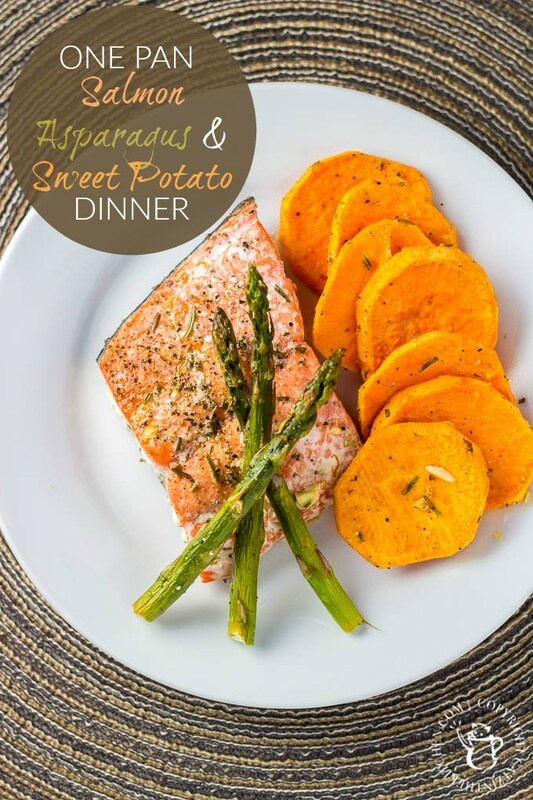 Sometimes you need a superfood fix, and this one pan salmon dinner with asparagus and sweet potatoes provides a full meal that is easy, healthy, and quick! Preheat oven to 350 degrees. Line a large rimmed baking sheet with parchment paper. 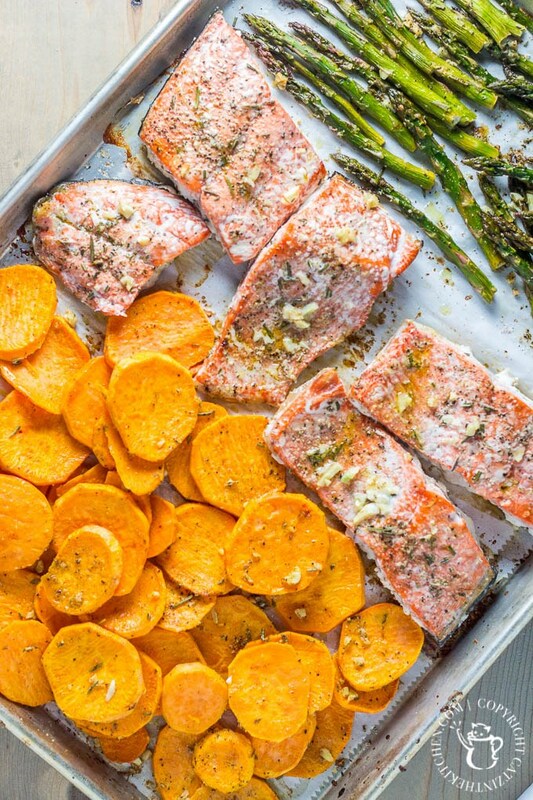 Place sliced sweet potatoes on side of the pan, drizzle with 1 1/2 tbsp of olive oil, 1 tbsp rosemary, 1 tbsp garlic, and salt and pepper. Toss to combine and roast for 40 minutes. When potatoes have roasted for 35 minutes, toss the potatoes for even cooking. 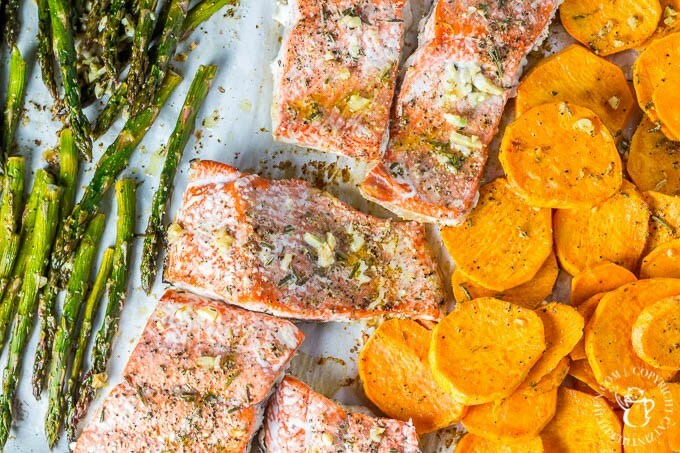 Place salmon and asparagus on the baking sheet. drizzle remaining olive oil, garlic, rosemary, salt and pepper and lemon juice over the salmon and asparagus. Sprinkle smoked paprika over the top of the salmon and place the baking sheet back in the oven for 18-20 minutes. 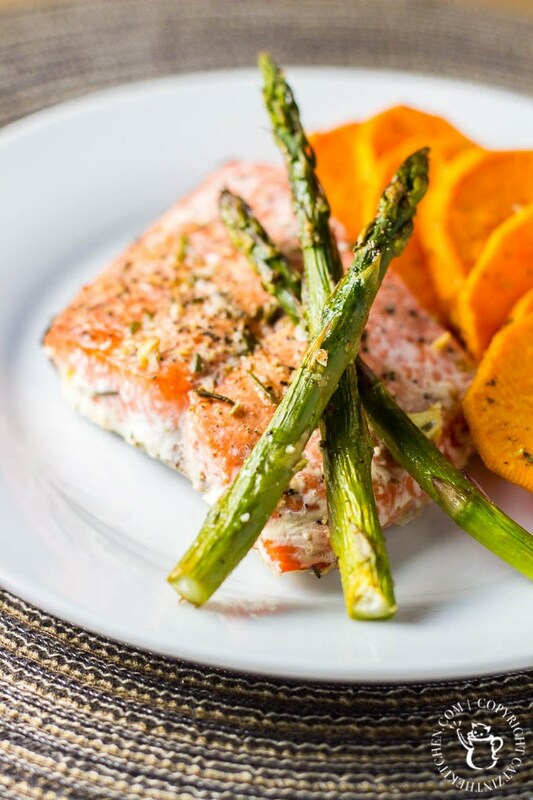 Cook until salmon is flaky. 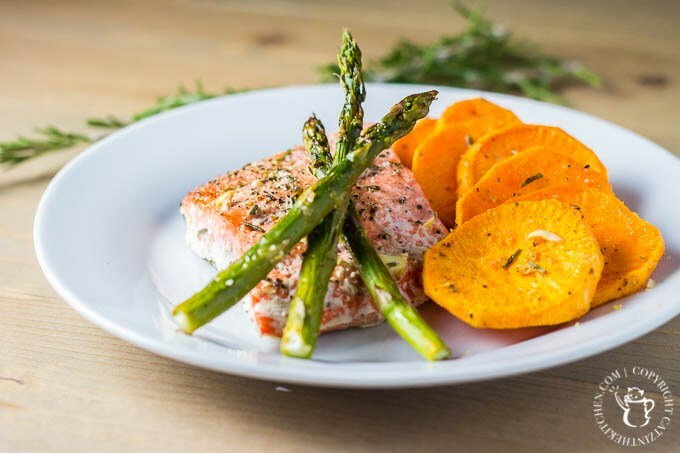 If the potatoes still need a bit more time, tent the asparagus and remove the salmon and cover with foil on a plate so the fish doesn't dry out.